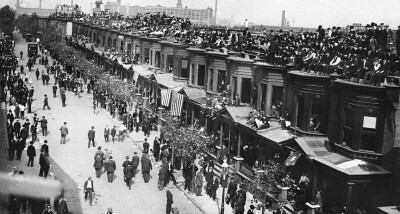 Morris Brooks, chief of the Bureau of Building Inspection, issued another order against “rooftop bleachers”. It turned out that Mrs. Durnin was correct. After taking the city to court, three judges concluded that the city could not prevent people from doing what they wanted with their homes. That said, the people who want to charge people to go on their roof must have bleachers installed and a railing atatched to the front of the bleachers. The bleachers could hold up to 80 people, with more gathered in front of bay windows. When you keep in mind that the wives and children also sell refreshments, the families on 20th street can really make a pretty penny these next few days. Seats in these bleachers are expected to go for at least $10 a pop, and there are rumors that property values in that part of town have gone up, since with the A’s looking like they’ll be good for years to come, there should be plenty more money making opportunities.